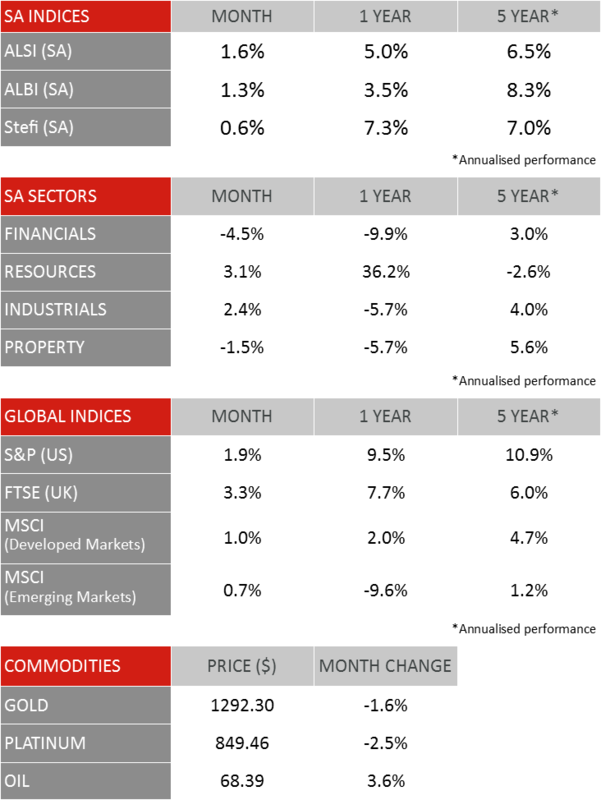 Local and offshore equity markets continued to move upwards in March, despite the seemingly endless barrage of fear-inducing headlines, both locally and globally. 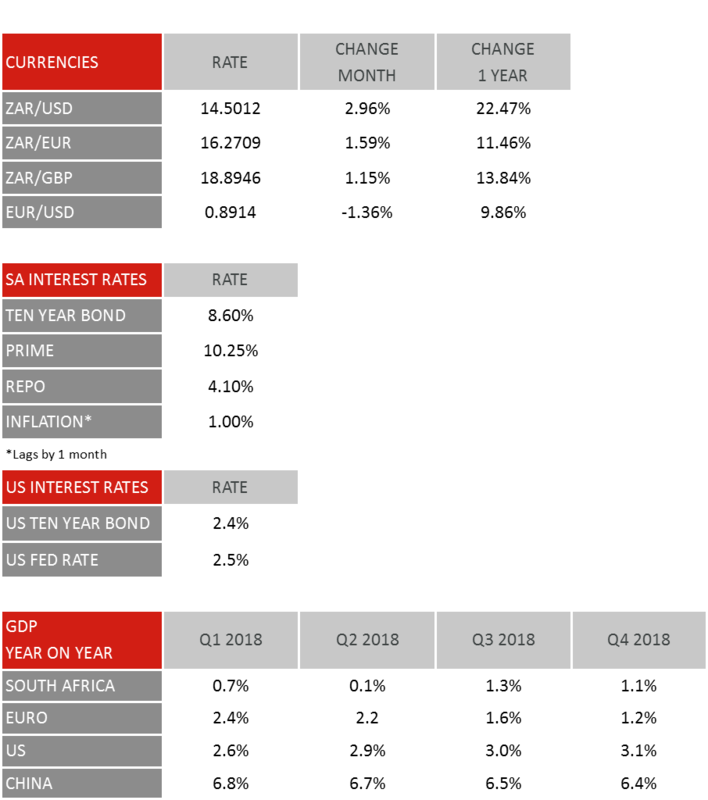 Despite the noise surrounding the big themes of Brexit, trade wars and an imminent US recession, global developed equity markets have recovered much of the value that was lost in the last quarter of 2018. The MSCI World Index is up 12.8% in the first three months of 2019. The JSE All Share Index, which lost 8.81% in the last 4 months of 2018, has gained 8% since the beginning of the 2019, restoring much of the value that was temporarily lost. Once again this shows that whilst volatility is real, it is best ignored. Negotiations to resolve the US/China trade war continued to make solid progress in March. The US and China have announced that they are very close to a deal on trade, with points on how to deal with current tariffs and how to enforce the agreement still being resolved. The possibility of a full-blown trade war, which weighed heavily on equity markets during 2018, appears to be fading. Trump has announced that he estimates an additional six weeks of negotiations will be needed to finalize an agreement. The 31st March 2019 deadline for the UK withdrawal has passed and the revised deadline is now the 12th April 2019. The deadline was extended by the European Union to allow the UK to hold a third vote on Theresa May’s deal – this vote failed by 58 votes. The European Council will meet again this week to debate another request by the Theresa May for a further deadline extension to 30th June 2019. The President of the Council is proposing a longer term, 12-month “flexible” Brexit deadline. Whilst the deadline discussion rumbles on, legislation known as The Cooper Bill, which has been passed by the House of Commons, is now in the House of Lords for ratification. This bill attempts to avoid “no-deal” by legally binding Theresa May into seeking an extension to Brexit beyond 12th April. At this point, “no deal” remains a risk, albeit a gradually reducing risk. The Pound Sterling which reached a low against the US Dollar of $1.24 in December is currently trading at $1.30, which is 5% stronger. Currency markets appear to be leaning towards a soft Brexit scenario at this point in time. The European Central Bank (ECB) only recently withdrew the long-term economic stimulus it had provided to support the European economy in the wake of the 2009 global financial crisis. However, given Germany’s slow down, and the pedestrian 1.3% growth that is forecast for Europe, the ECB has announced plans to once again stimulate the Eurozone’s slowing economy beginning in September. This news was unexpected and should keep European interest rates steady through 2019 and beyond if deemed necessary.